The Internet of Things (IoT) promises to help businesses cut costs and create new revenue streams, but it also brings an unsettling amount of risk. No one wants a fridge that gets shut down by ransomware, a toy that spies on children, or a production line that’s brought to a halt through an entry point in a single hacked sensor. So how can device builders bring a high level of security to the billions of network-connected devices expected to be deployed in the next decade? It starts with building security into your IoT solution from the silicon up. In this piece, I will discuss the holistic device security of Azure Sphere, as well as how the expansion of the Azure Sphere ecosystem is helping to accelerate the process of taking secure solutions to market. For additional partner-delivered insights around Azure Sphere, view the Azure Sphere Ecosystem Expansion Webinar. Small, lightweight microcontrollers (or MCUs) are the most common class of computer, powering everything from appliances to industrial equipment. Organizations have learned that security for their MCU-powered devices is critical to their near-term sales and to the long-term success of their brands (one successful attack can drive customers away from the affected brand for years). Yet predicting which devices can endure attacks is difficult. Hardware-based root of trust: The device must have a unique, unforgeable identity that is inseparable from the hardware. Small trusted computing base: Most of the device's software should be outside a small trusted computing base, reducing the attack surface for security resources such as private keys. Defense in depth: Multiple layers of defense mean that even if one layer of security is breached, the device is still protected. Compartmentalization: Hardware-enforced barriers between software components prevent a breach in one from propagating to others. Certificate-based authentication: The device uses signed certificates to prove device identity and authenticity. Renewable security: Updated software is installed automatically and devices that enter risky states are always brought into a secure state. Failure reporting: All device failures, which could be evidence of attacks, are reported to the manufacturer. These properties work together to keep devices protected and secured in today's dynamic threat landscape. Omitting even one of these seven properties can leave devices open to attack, creating situations where responding to security events is difficult and costly. The seven properties also act as a practical framework for evaluating IoT device security. Azure Sphere – Microsoft’s end-to-end solution for creating highly-secure, connected devices – delivers these seven properties, making it easy and affordable for device manufacturers to create devices that are innately secure and prepared to meet evolving security threats. Azure Sphere introduces a new class of MCU that includes built-in Microsoft security technology and connectivity and the headroom to support dynamic experiences at the intelligent edge. Multiple levels of security are baked into the chip itself. The secured Azure Sphere OS runs on top of the hardware layer, only allowing authorized software to run. The Azure Sphere Security Service continually verifies the device's identity and authenticity and keeps its software up to date. Azure Sphere has been designed for security and affordability at scale, even for low-cost devices. In today’s world, device manufacturing partners view security as a necessity for creating connected experiences. The end-to-end security of Azure Sphere creates a potential for significant innovation in IoT. With a turnkey solution that helps prevent, detect, and respond to threats, device manufacturers don’t need to invest in additional infrastructure or staff to secure these devices. Instead, they can focus their efforts on rethinking business models, product experiences, how they serve customers, and how they predict customer needs. To accelerate innovation, we’re working to expand our partner ecosystem. Ecosystem expansion offers many advantages. It reduces the overall complexity of the final product and speeds time to market. It frees up device builders to expand technical capabilities to meet the needs of customers. Plus, it enables more responsive innovation of feature sets for module partners and customization of modules for a diverse ecosystem. Below we’ve highlighted some partners who are a key part of the Azure Sphere ecosystem. Seeed Studio, a Microsoft partner that specializes in hardware prototyping, design and manufacturing for IoT solutions, has been selling their MT3620 Development Board since April 2018. They also sell complementary hardware that enables rapid, solder-free prototyping using their Grove system of modular sensors, actuators, and displays. In September 2018, they released the Seeed Grove starter kit, which contains an expansion shield and a selection of sensors. Besides hardware for prototyping, they are going to launch more vertical solutions based on Azure Sphere for the IoT market. In March, Seeed also introduced the MT3620 Mini Dev Board, a lite version of Seeed’s previous Azure Sphere MT3620 Development Kit. Seeed developed this board to meet the needs of developers who need smaller sizes, greater scalability and lower costs. AI-Link has released the first Azure Sphere module that is ready for mass production. AI-Link is the top IoT module developer and manufacturer in the market today and shipped more than 90 million units in 2018. Avnet, an IoT solution aggregator and Azure Sphere chips distributor, unveiled their Azure Sphere module and starter kit in January 2019. Avnet will also be building a library of general and application specific Azure Sphere reference designs to accelerate customer adoption and time to market for Azure Sphere devices and solutions. Universal Scientific Industrial (Shanghai) Co., Ltd. (USI) recently unveiled their Azure Sphere combo module, uniquely designed for IoT applications, with multi-functionality design-in support by standard SDK. Customers can easily migrate from a discrete MCU solution to build their devices based on this module with secured connectivity to the cloud and shorten design cycle. 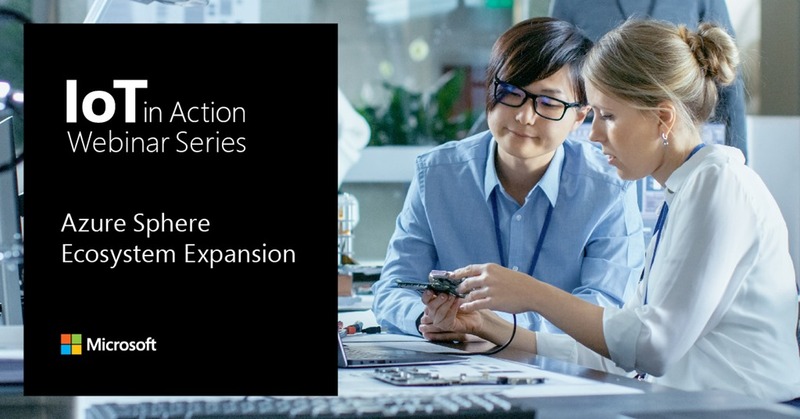 To learn more, view the on-demand Azure Sphere Ecosystem Expansion webinar. You’ll hear from each of our partners as they discuss the Azure Sphere opportunity from their own perspective, as well as how you can take full advantage of Azure Sphere ecosystem expansion efforts. For in-person opportunities to gain actionable insights, deepen partnerships, and unlock the transformative potential of intelligent edge and intelligent cloud IoT solutions, sign up for an in-person IoT in Action event coming to a city near you.